Located at the heart of the downtown Roppongi area in Tokyo's tallest building, the 53rd-storey Ritz-Carlton offers elegant luxury high above Tokyo’s busy streets. It features an indoor pool and 8 dining options. Free WiFi is available throughout the property. 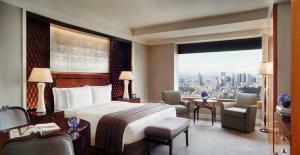 Rooms at the Tokyo Ritz-Carlton offer breathtaking views of the Shinjuku area, the Imperial Palace or Mount Fuji. All rooms come with a DVD player and a spacious marble bathroom. You will find a flat-screen TV with satellite channels, minibar and coffee machine. Guests can pamper themselves with a treatment at the spa, or unwind in a whirlpool with city skyline views. Other facilities include saunas, a gym and bicycle rental. 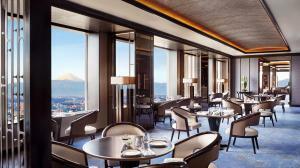 Restaurants at the Ritz-Carlton vary from French to Japanese cuisine, all offering spectacular views. 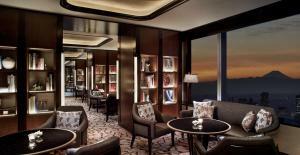 The Michelin star rated restaurant Azure 45 serves French delicacies, while guests can enjoy live musical performance in the afternoon and evening at The Bar. The Ritz-Carlton Tokyo is directly connected to Roppongi Station, which offers easy subway access to Shinjuku and Akihabara. The National Art Centre and Roppongi Hills are about a 10-minute walk. Tokyo Station and the Imperial Palace are both a 20-minute taxi ride away. Rooms on top floors, with spectacular views. Club Lounge privileges, including complimentary food and beverages. A flat-screen TV with satellite channels, minibar and coffee machine are available. This spacious one-bedroom suite with a large living room features views of Tokyo Tower and skyline of Shinjuku. A flat-screen TV with satellite channels, minibar and coffee machine. Located on the club floors, this spacious one-bedroom suite with a large living room provides views of Tokyo Tower and the skyline of Shinjuku district. This suite includes exclusive club privileges including concierge and food/beverage offerings at the club lounge. You will find a flat-screen TV with satellite channels, minibar and coffee machine. Located on the club floors, this deluxe room includes exclusive club privileges including concierge and food/beverage offerings at the club lounge. There are a flat-screen TV with satellite channels, minibar and coffee machine. This room is fitted with either 1 extra-large double bed or 2 standard double beds. 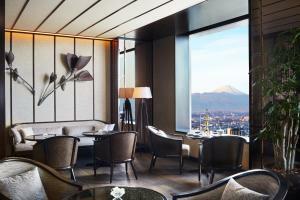 This one-bedroom suite is located on club floors and boasts panoramic views of Fuji Mountain and Shinjuku's skyline. This suite includes exclusive club privileges including concierge and food/beverage offerings at the club lounge. You will find a flat-screen TV with satellite channels, minibar and coffee machine. This one-bedroom suite is located on club floors and features an en suite bathroom with marble floors, walls and wash basin. This suite includes exclusive club privileges including concierge and food/beverage offerings at the club lounge. There are a flat-screen TV with satellite channels, minibar and coffee machine. 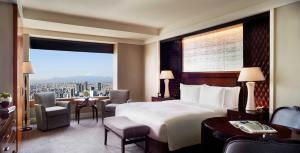 Located on the club floors, this room boasts sweeping city views of Tokyo. This room includes exclusive club privileges including concierge and food/beverage offerings at the club lounge. A flat-screen TV with satellite channels, minibar and coffee machine is also provided. This one-bedroom suite with a large living room is located on club floors. This suite includes exclusive club privileges including concierge and food/beverage offerings at the club lounge. A flat-screen TV with satellite channels, minibar and coffee machine. 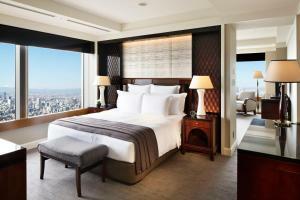 Located on the 47th to 51st floors, this room boasts panoramic city views of Tokyo. You will find a flat-screen TV with satellite channels, minibar and coffee machine. The room is fitted with an extra-large double bed. Rate: ¥ 68904.00 ... ¥ 192931.00; select dates below to get current rates. This air-conditioned one-bedroom suite features panoramic views of Mount Fuji and Shinjuku district. A flat-screen TV with satellite channels, minibar and coffee machine are available. Featuring tatami (woven-straw) flooring and Japanese Shoji doors, this suite is fitted with futon mats to be spread on the floor. Guests can view Tokyo Tower from the suite. A flat-screen TV with satellite channels, minibar and coffee machine are offered. This one-bedroom suite features a living room offering panoramic views of Tokyo Tower and Tokyo Sky Tree. Full marble bathroom has a large window overlooking the city. A flat-screen TV with satellite channels, minibar and coffee machine are available. This double room features views of Tokyo Tower. There are a flat-screen TV with satellite channels, minibar and coffee machine. Rate: ¥ 74541.50 ... ¥ 186667.00; select dates below to get current rates. This one-bedroom suite with a large living room features views of Tokyo Tower. There are a flat-screen TV with satellite channels, minibar and coffee machine. 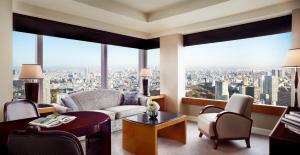 Located on the 47th to 51st floors, this room boasts a views of Tokyo Sky Tree and the garden of the Imperial Palace. A flat-screen TV with satellite channels, minibar and coffee machine are provided. The room is fitted with 2 double beds. Rate: ¥ 76778.70 ... ¥ 187562.00; select dates below to get current rates. This twin room has a minibar, DVD player and CD player.